In the next decade, the energy storage industry will go from the familiar, like the iPhone, into much bigger applications like electric cars and the power grid. Photos courtesy of the Pacific Northwest National Laboratory, Pixabay, Dave Dugdale/Flickr (Tesla). First in a series. Click here to read part two. Julie Blunden is a former solar executive who now focuses her analytical ability on energy storage. When she sits down with an iced tea to run the numbers, they fill her with a sense of urgency. She sees a market that is strapping on its boots for a steep and inexorable climb. Blunden and a growing number of experts believe that energy storage will be worth tens of billions of dollars in revenue within a decade, regardless of what the Trump administration does to harm or help. Batteries will start showing up everywhere, sending shock waves through the auto industry, the electric grid, the petroleum industry and the broader power sector, adding tens of thousands of manufacturing jobs to the economy. The question that Blunden keeps asking herself is whether that money and those jobs will go to Michigan and North Carolina, or flee to Shanghai or Seoul, South Korea. The problem, Blunden said, is that the United States is wandering into a global competition without much urgency or a plan. "Are we going to make the decision to take a significant share of the next wave of manufacturing growth globally?" Blunden asked. "Or are we just going to give it to [Asia]?" This E&E News series explores what it would look like for the United States to seize the coming energy storage industry. Based on interviews with dozens of industry insiders, it looks at the opportunities and challenges, the prospects for jobs and where the emerging hubs are, from Silicon Valley to North Carolina. One company, Tesla Inc., is intent on becoming a battery superpower unto itself as it builds a titanic factory in the Nevada desert. But the emerging business is so large and multifaceted that even someone as ambitious as Tesla's founder, Elon Musk, can't do it by himself. So far, the United States lacks the combination of entrepreneurial collaboration, government policy and nationalistic fervor that will be necessary to wrest the early lead from China, South Korea and Japan. "As one of the biggest and largest first-use markets, we can drive the agenda and create a leadership position for the U.S.," said Danny Kennedy, the president of CalCharge, a group trying to build an energy storage ecosystem in California. "That's the Trumpian opportunity." "Energy storage" is the catch-all term for a sprawling industry. Here, a factory employee works with an advanced lead-acid battery meant for internal-combustion cars. His employer, Johnson Controls, is spending $245 million this decade to double production in North America. Photo courtesy of Johnson Controls. Energy storage is a difficult market to fathom because it requires a leap of imagination. The battery seems familiar — who hasn't popped a few AAs into a flashlight? — but the new incarnations are hard to picture. The electric grid, often called the world's greatest machine, was built without the ability to store electricity. The batteries of the future might move our cars, soak up output from North Dakota wind farms and California rooftop solar panels, shape the electrical load of entire utilities, shave the peaks of demand from buildings, assist overloaded substations — and maybe do several of these jobs at the same time. The energy storage industry is both old and new. On one hand, it's a frontier industry that's up for grabs; on the other, America has played a robust hand for decades. Blunden calls it "vast yet puny" — an irregular army of entrepreneurial energy that is unprepared for the magnitude of what's to come. Energy storage employed almost 48,000 people last year, according to a Department of Energy census, with some of its biggest footprints in states that President Trump carried in last year's election. In the ascendant technology, lithium ion, the United States is the world's innovation engine, producing most of the patents and technological breakthroughs. It has the best-trained scientists and engineers working at its universities, corporate campuses and national laboratories. As batteries make a turn toward vehicles and the electric grid, the nation is in the lead on nearly every front. It has the most entrepreneurial startups, the best meshing of electronics and software, the most creative business models, the most daring utility projects. But when it comes to lithium ion, the country is at a serious manufacturing disadvantage. In the early 1990s, China, Japan and South Korea each undertook the marathon necessary to build a battery-manufacturing industry. Lithium ion was the world's first battery chemistry that was both energy-dense and rechargeable. Through a meshing of industrial effort and government policy, they mastered the manufacturing process that made possible the explosion of consumer electronics — camcorders, iPods, laptops, mobile phones, Fitbits. American researchers invented the lithium-ion battery, just as they did the VCR, the cellphone, the laptop and the solar panel. Asian manufacturers seized on each and came to dominate the market, as America's manufacturing base slipped away. Energy storage represents a rare do-over opportunity. With a burgeoning market and the prospect for new technologies that could upset the existing order, many in the industry believe that it's time for the United States to get its act together. "This is it. This is the moment," Blunden said. "The conversations need to go from arm-wavy to concrete really soon, like in the next six months." 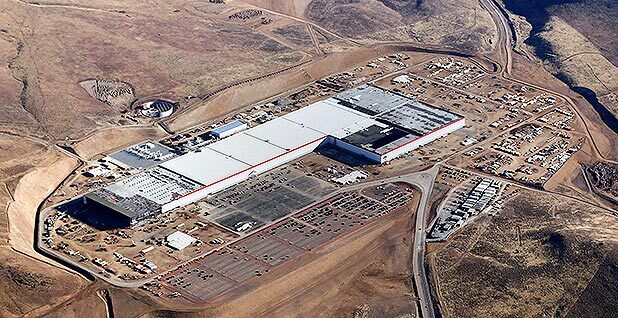 Tesla Inc.'s battery Gigafactory under construction in January. When completed in 2020, it will cover every part of this photo that isn't desert. It will be one of the world's largest buildings and will more than double the world's production of lithium-ion batteries. Photo courtesy of Tesla. Today, lithium-ion batteries are a market worth in the neighborhood of $7 billion or $8 billion, according to several analysts. Those batteries power the vast majority of mobile phones and other consumer electronics, as well as battery-powered hardware like drills and chain saws. In the next few years, that market will start to change and accelerate. Two products are at play: batteries for electric cars and batteries for homes, businesses and the grid, collectively known as stationary storage. Analyst firms like Morgan Stanley and UBS AG often look at energy-storage market factors, like revenue or number of megawatts. But for a comparison that anyone can understand, consider weight. Apple's iPhone has a battery that weighs less than a third of a pound. The battery of the Model S, the premium sedan from Tesla, weighs about 1,200 pounds. To equal the weight of batteries in one Tesla, Apple would need to make almost 4,000 iPhones. That seems like a lot, until one considers that Tesla expects to sell 50,000 of the Model S (along with its SUV, the Model X, with an even heavier battery) in the first half of this year. That's the battery-weight equivalent of 198 million iPhones, which is more than Apple sold in all of 2014. That's six months of production, by one company. Nissan Motor Co. and General Motors Co. are already producing full-electric cars, and other automakers, from Ford Motor Co. to Volkswagen AG, plan to produce many models more. Estimates of what portion of cars will be electric by 2040 vary widely: Exxon Mobil Corp. says it will be less than 10 percent, while Bloomberg New Energy Finance expects 35 percent. Either way, it's a lot of battery. As the electric-car market warms up, a market of equal or greater size is growing alongside. Analysts estimate that stationary storage — batteries for buildings and the grid — will grow fivefold between now and 2020, from about $400 million to about $2 billion. Let's look at Tesla again. Tesla's entry into grid-scale energy storage is called the Powerpack. It weighs 3,575 pounds, or almost three times a Model S battery, or the equivalent of almost 12,000 iPhone batteries. In January, Tesla announced its biggest-ever deployment of Powerpacks, an emergency deployment to make up for the loss of the leaking Aliso Canyon natural gas storage field in California. 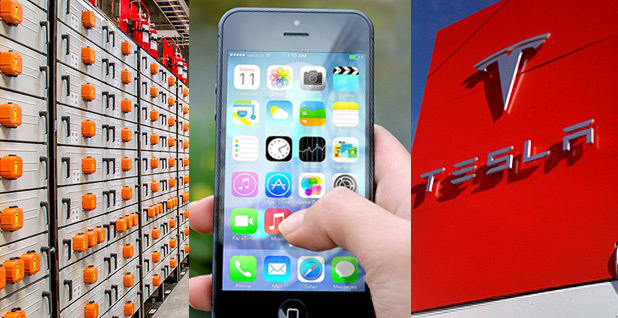 Tesla deployed 198 Powerpacks, or the battery-weight equivalent of 2.3 million iPhones. By 2022, GTM Research estimates, the grid will host 30 times what Tesla just installed, or 2.6 gigawatts of energy storage. If all of that energy demand were met with today's Powerpacks, it would be the weight equivalent of the batteries of 60 billion iPhones, or almost eight and a half iPhones for every person on Earth. That's a lot of batteries. How quickly electric cars will grow, or spread onto the grid, is up for debate. But the take-home message, the one that has dawned on relatively few people, is that it won't take much for the market to explode. Some portion of the drivers who now pump gas will instead plug in a car with a battery. A portion of the coal and natural gas that now powers the grid will instead be dispatched by a battery. The fluctuating output from wind and solar farms will be stored in a battery. Some part of the electricity coursing through substations will be stored in a battery. You only need to grab a modest piece to make one of the big businesses of the 21st century. Scientists at Argonne National Laboratory puzzle through battery chemistry. The Argonne lab is leading a $120 million effort among 20 institutions to create new battery chemistries that could outperform lithium ion. Photo courtesy of the Joint Center for Energy Storage Research. All this raises the question: Who will lead the industry and make all those batteries? If they all needed to be made today, the obvious answer would be China, Japan and South Korea. Asia is where 88 percent of all lithium-ion batteries are made now, according to a study by the National Renewable Energy Laboratory. It not only makes the batteries; it makes the machines that make the batteries. For example, when the University of Michigan built its $10 million battery lab, it had to import most of its manufacturing equipment from Asia, because no one makes it here, according to Mark Barteau, a professor who oversees the lab. "The people working on this in South Korea and Japan just really understand this technology," said Ted Miller, the manager of energy storage and materials strategy at Ford. "It's hard-earned, and it doesn't come easily." But there are reasons to believe that Asia doesn't have a lock on battery manufacturing. One is that the market might grow so fast that even the mighty factories of Asia won't be able to keep up. That's a reason that South Korean conglomerate LG Chem Ltd. is producing lithium-ion auto batteries in Michigan, with a factory identical to the one it developed in South Korea. "We lifted up a proven process in Korea and brought it to the states," the Michigan factory's manager, Nick Kassanos, said in an interview. When it comes to stationary storage, the United States is by far the world's largest market. While it may not make the batteries, it leads the world in deploying energy storage in buildings and on the grid, and it integrates the package with the most sophisticated energy-management software and services, said Ravi Manghani, an analyst with GTM Research. Another reason the United States may compete is that it leads in research on alternatives to lithium ion and in making lithium ion better. Some approaches have little to do with chemistry, such as filling caverns with compressed air, spinning flywheels extremely fast or storing energy in a train car filled with concrete. But more attention is on improving chemistry, including formulations that could replace lithium ion. The Joint Center for Energy Storage Research (JCESR), based at Argonne National Laboratory outside Chicago, is operating with $120 million from the Department of Energy. With 20 participating institutions, it is creating four new prototypes of batteries, each with the goal of achieving five times the density and one-fifth the cost of today's lithium-ion batteries. They're due near the end of this year. These chemistries, including lithium-sulfur and an organic "flow" battery, would entail new manufacturing processes that would essentially start the industry over and erase Asia's lead. "When it emerges, we'll all be in the same place," said George Crabtree, the director of JCESR. The United States produces most of the technological breakthroughs in energy storage and has the most innovative software, the most creative startups, the most receptive customers and a formidable industrial backbone. This hasn't gone unnoticed among big Asian and European companies, which have been on a buying and investment spree. In the past two years, Seattle's 1Energy Systems has been bought by South Korea's Doosan Heavy Industries & Construction; French utility Engie SA has bought the San Francisco Bay Area's Green Charge Networks; Italian power company Enel SpA bought Demand Energy Networks Inc. of Washington state; and Dyson, the British company known for its vacuums, bought Michigan's Sakti3. Celgard of North Carolina was sold in 2015 to Asahi Kasei Corp. of Japan. At the same time, foreign concerns are building in America. 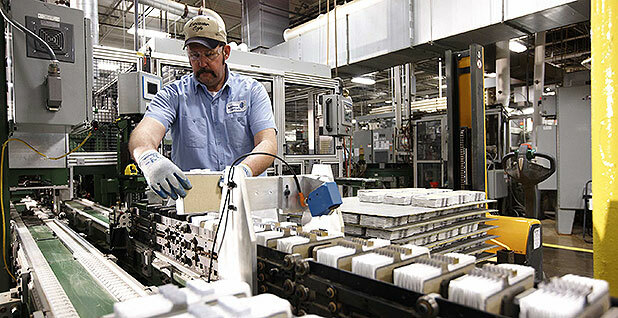 Many of the fastest-growing U.S. manufacturers of lithium-ion batteries are foreign-owned. France's Saft Group SA has a factory in Jacksonville, Fla.; LG Chem has its plant in Holland, Mich.; and Alevo Group SA in Charlotte, N.C., has Swiss owners. Sonnen GmbH of Germany announced last month that it would build a factory in Atlanta. Meanwhile, global automakers including Daimler AG, BMW AG and Nissan are flirting with following Tesla's lead and entering the residential battery market. The homegrown manufacturer with the greatest ambition is, again, Tesla. Even as he makes repeated visits to Washington, D.C., to persuade Trump about the value of his businesses, Musk has announced that this year he will unveil the sites for a second, a third and perhaps even a fourth battery Gigafactory (EnergyWire, Feb. 6). It is likely that at least one will be located abroad. If Trump is looking to nurture an energy storage industry, one group has an idea where he should look. Its proposal is waiting at the Department of Commerce. The plan, created by a nationwide coalition calling itself SuperCharge US, was submitted a year ago to the National Institute of Standards and Technology (NIST) in response to a request for proposals to soup up advanced manufacturing. NIST is part of the Commerce Department. The plan brings together the first nationwide public-private consortium with the goal of capturing the manufacturing base for two big future markets — vehicles and the grid. "These two economic disruptions will unleash a virtuous spiral of battery research, development, manufacturing, and deployment that the U.S. could coordinate and accelerate," the proposal says. It asks for $70 million that would be matched by $200 million from the states and the private sector. Education, job training and business development are its thrusts. 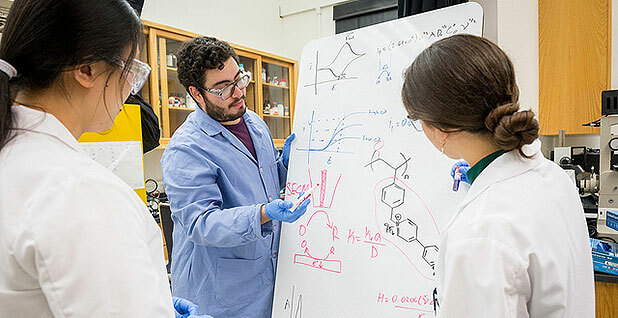 It would coordinate research and share best practices among a dozen university, private and national labs that have a role in energy storage, from San Diego to upstate New York, and would fund a new battery lab in the San Francisco Bay Area for up to $10 million. Its goal is to take research in U.S. labs and "pass the baton to industry," in the words of Alex Luce, the program manager of CalCharge. That California program joined with the country's other principal state organization, the New York Battery & Energy Storage Technology Consortium, as an organizer. However, the award is subject to the same ax that now hangs over much of the U.S. government's spending. On Thursday, the Trump administration unveiled a budget that called for $1.5 billion in cuts at the Commerce Department, including a program that funds manufacturing partnerships. Still, the proposal's authors remain hopeful. Unlike wind or solar, and unlike coal or petroleum, no political camp has declared energy storage as the enemy. It is arriving at its moment without much ideological baggage. "It's good for red states, good for blue states, good for solar, good for wind," said Matt Roberts, head of the Energy Storage Association. "There's no downside in being good at energy storage."